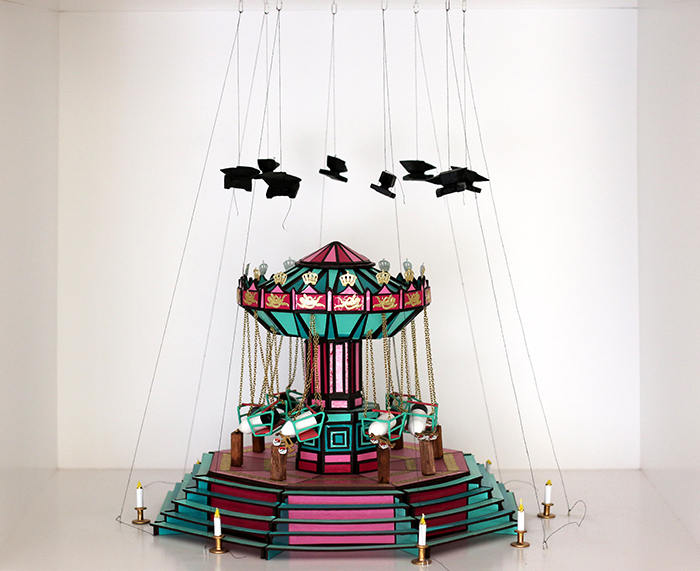 A carousel with eight seats is set up in a room. There is a scuba tank placed on each seat, lashed with a truck safety strap. The scuba tanks are filled with 300 bars of compressed air. A pressure gauge has been screwed onto the tanks. Each pressure gauge rests on a 60 cm high block of squared timber, which has been placed next to the seat. Eight candles are positioned on the floor around the carousel. A hemp cord, fastened to the ground with a hook, is set up in front of each candle. The cord is guided 40 cm above the candles to a hook on the ceiling, and then down to one meter above the manometers. Hanging from the end of each hemp cord is an anvil, which is aligned exactly above the manometer. The candles are ignited simultaneously. After an indefinite period of time, a hemp cord is burned through and an anvil falls onto a manometer. The manometer breaks off and the bottle’s contents escape suddenly. Some seats tear off, flying through the room. Maybe the carousel starts to move.